Butter your cob right the first time. This corn butterer conforms to the cob’s contour and distributes it evenly—not a kernel left behind. Its curved stainless steel blade has a beveled edge so you can scoop straight from the tub or slice the stick, then spread in a single motion. Plus, there are two knives so you don’t have to wait your turn. Got one for our house and one for my sis’s new place. Corn on the cob not is season currently butmlooking forward to using this product when the cons are in season. 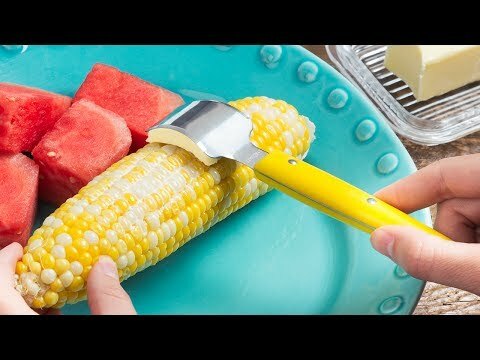 These butter spreaders work great to put butter on your corn on the cob. Highly recommended. This really is a great way to butter corn. We love it! this gadget keeps butter where you want it. 'nuf said. Buttering corn can’t be graceful? ButterOnce begs to differ. It’s a butter spreader for corn on the cob that slides, glides, and conforms to the cob’s curve—melting and distributing it evenly—so every kernel gets a turn. The beveled stainless steel edge (on either side) cuts and scoops the butter pre-spreading. Get buttering right the first time and a perfectly-buttered bite every time.